If you are traveling to Reading for the first time, the city is known as the 'Shopping Capital of the World' due to its incredible variety of shopping outlets scattered along the city. Apart from shopping opportunities, Reading PA features many inner city parks, lakes and a couple of state parks within a short distance where you can enjoy outdoor activities such as camping, hiking, fishing and boating. If you are using car rental and are planning on exploring nearby cities, Reading PA is only an hour’s drive from Hershey Pennsylvania, Lancaster PA and Philadelphia PA.
Additionally, Reading PA is also within driving range of New York City, New Jersey, Maryland and Wilmington Delaware in Delaware State. The city of Reading PA is home to around ten city parks, lakes and state parks, where you can enjoy a myriad of recreational activities. Fishing opportunities can be found at both Antietam Lake and Kaercher Creek Park. Antietam Lake is the closest to the city center, located 4 miles north east of the city center; while Kaercher Creek Park is located 20 miles north of Reading PA in the town of Hamburg. If you’re traveling with the family and are planning on doing other activities apart from fishing, Kaercher Creek Park is your best bet. The park also features a launching ramp for boats, fishing docks, electricity hook-ups, picnic and grill areas, playgrounds for kids and walking trails. Another excellent place where you can explore the outdoors and enjoy hiking trails is at Nolde Forest State Park. This state park is only a 10 minute drive by car, and offers miles of easy trails through beautiful woodland. If you are an avid mountain biker or are looking to camp out during your trip to Reading PA, French Creek State Park offers plenty of challenging biking and hiking opportunities. The state park is also home to a campground that has amenities such as toilets, showers and electricity hook-ups. French Creek State Park is only 17 miles south of Reading PA and it takes about 20 minutes drive to get there. - The Union Canal Trail, which runs along the Schuylkill River from Montgomery Street to Camp Joy through beautiful natural scenery. 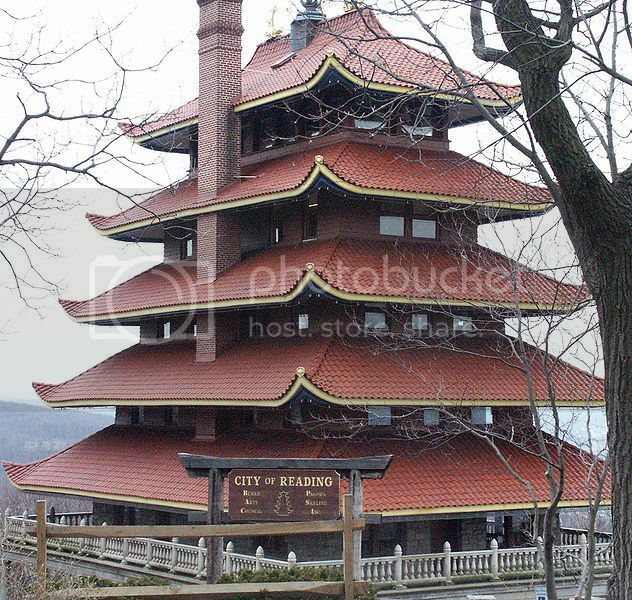 - The Schuylkill River Trail - Thun Trail, which spans over 100 miles from Tamaqua to Philadelphia PA, passing through Reading PA.
One of the most historic and recognizable landmarks in Reading PA, it’s the Pagoda, which was built on the slope of Mount Penn in 1910 to resemble a Japanese Pagoda. The fourth floor of this five-story pagoda is open to the public and features a gift shop and museum. If you love anything to do with art and want to spend a fun day out, the GoggleWorks Center is one of the most popular things to do in Reading PA. The GoggleWorks Center, located along Washington Street, features art galleries such as glass art works, as well as Sunday workshops you can join where you can learn the art of glass blowing and jewelry-making. If you are looking for more things to do in Reading PA with kids, the Reading Public Museum is another must-visit attraction worth adding to the Reading PA itinerary. The museum is located along Museum Park, and features fun educational programs, a planetarium and an arboretum. If you are a shopping enthusiast, Reading PA is home to many outlets and malls where you can find many bargains. For instance, in West Reading, you can find VF Outlet and Berkshire Mall, which are located a short drive of Reading's city center. The downtown area of Reading PA is the hotspot for nightlife in the city and it is here where you'll find many bars, restaurants, pubs and nightclubs such as 1402 Bar & Nightclub located along 9th Street, Al’s Diamond Cabaret along 5th Street and El Tapatio along Walnut Street. If you enjoy movies, the A-1 Cinema Center‎ at the Fairgrounds Square Shopping Mall it’s one of the biggest cinema complex in town, with over ten screens and stadium-style seating. If you are visiting Reading PA in April, the 'Go Fly A Kite!' Day event is one of the most popular spring events in Berks County, and one event not to be missed if you are traveling with the family. At the 'Go Fly A Kite!' Day event, you can participate in kite events, watch kite demonstrations and even learn how to fly a kite. The Children’s Fishing Rodeo event is another popular family event that happens in May at Hunsicker's Grove in Mertztown, which is just half-hour drive from the city center. If you’ve always wanted to enjoy a family fishing trip, the Children’s Fishing Rodeo is a great event where kids can learn fishing techniques. If you are a Bluegrass music fan, the Fiddle Festival showcases popular Bluegrass artists on an open stage at the Heritage Center in May.